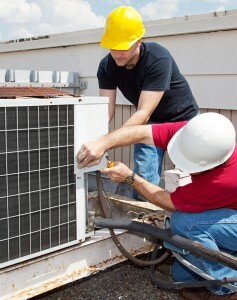 Air conditioner units need scheduled maintenance to stay energy efficient and minimize larger repairs in the future. You can accomplish a pre-season cleaning to prep yourself or trust a reliable professional. As we approach the warmer months in Boston it will suddenly be time to turn on your cooling unit and think about Air Conditioning service or repair. Generally, spring and fall are the seasons with the mildest weather. It is best to properly prepare unit before the summer to ensure it will work comfortably and function efficiently for the hot temperatures. Is it best for you to do-it-yourself (DIY) or to have a reliable professional service team to do the work for you? The purpose of this article is to detail the process of cleaning an air conditioner unit to help restore and maintain the air conditioner unit’s efficiency for max comforting effect. Though routine, this process is time consuming, complicated, and could be very costly if the maintenance is not done correctly. The intricacies of fixing an air conditioner should be handled by a knowledgeable team if you really don’t have a clue where to begin. 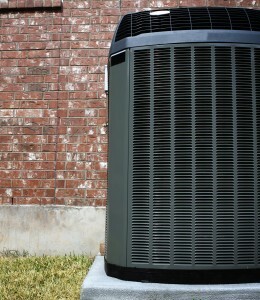 During the cold months when most precipitation happens, AC units are usually idle with a lack of usage from its owners. Routine maintenance for an air conditioner unit is so important because the more that the unit accumulates dust and other debris, the less efficient it becomes. You’ve been warned – skipping maintenance before the season can cause more long term effects and costs than you expect. Air conditioner efficiency gets lost by 5% each year of its operation. The compounded loss of efficiency causing stickiness in the atmosphere. Airflow could be obstructed in the system. Will accumulate dirt in the air conditioner unit’s coils. Your home value decreases with a poorly maintained ventilation system. A machine can lose 5% to 15% of the air conditioner’s max efficiency from clogged filters in the ventilation system. These effects may seem small, but over time they certainly add up. The cost of the repairs will make you dig deeper in your wallet for a busy service professional to fix it in the summer when you need the cool air the most. Also, consider the Laws of Supply and Demand: professional HVAC technicians could potentially charge top-of-the-line prices for last minute service in the midst of the summer when demand for home cooling is at its highest. The DIY approach can be somewhat complicated, and can be a messy experience. If you would like to try handling your AC system’s maintenance, we’ve included tips to prepare for the year. This is not a complete list and we suggest you leave it up to the professionals. We recommend you work with our staff to prepare your AC unit and that you sign up for the Total Comfort Plan which gives you yearly AC and Heating Unit maintenance. 1. Always Shut Off the Power on Your Home’s Condenser Before Working on the AC Unit – Very near your unit you will usually locate a 240-volt weatherproof disconnect box. It contains a circuit breaker, fuses, and a lever. This must be turned off before doing anything because its high electrical charge can be dangerous. In fact, avoid touching all electrical components for your own safety. Allow a half hour interval between the time you turn it off to the time you begin the repairs on the unit. 2. Clean and Replace the Filters – This is the easiest step amongst them all. Clean or replace your furnace or air filter twice per year, or when they begin to look clogged. If you do not carry out this step, it will restrict the airflow of your AC unit, reducing its efficiency, and will circulate dust and dirt in your home. You can get new air filters at your local hardware store. 3. Clean the AC Condenser Coils – When you go outside to your AC unit next to your house, the condenser coils has a large fan covered by what looks like grills. During the winter, this is usually covered by a tarp or special cover. If not covered, this will eventually accumulate dirt and debris and become clogged eventually. Cleaning the coils begins with giving yourself access to the condenser unit. You’ll need to either remove the panels from the sides and top or the unit’s protective grills with a suitable tool; a nut driver or screwdriver will do the trick. Before you expose the condenser check to be certain that there is no power to the unit. Once the side panels have been removed and pulled away to expose the unit, remove the top. The attached fan will give the top some weight. Use caution when lifting it off. The wires connecting the unit to the fan can be fragile so don’t pull or tug on them. Gently use a refrigerator coil brush to clean off the dust and debris. Use care to ensure you don’t bend the fins or otherwise cause damage to the coils. A “fin comb” made specifically to straighten bent fins can be used to effect any needed repairs of this sort. 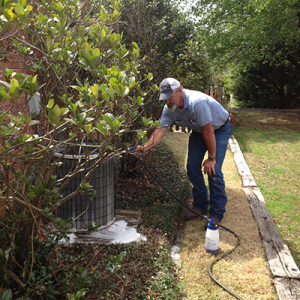 Once the outside of the condenser coils are clean, a vacuum can be used to clean them on the inside. 4. Clear Out the Debris and Clean the Fan Blades – This is where you will see if there are leaves or debris inside the condenser. If present, the drain at the bottom of the condenser needs to be cleared with a vacuum. As for the fan blades, use a dry cloth to wipe off the dust. Next, check the mounting bolts to make sure they are snug and tighten any that are loose. Some fan motors will have oil ports and it is useful to lubricate them by spraying WD-40 into the ports or by using a lightweight oil. Any remaining water or residue left inside the unit should be removed with a mop or towel before putting the condenser back together. 5. Review the Coolant Lines – Tubes or small pipes connect the condenser to the air handler and convey refrigerant. To avoid losing energy in the transfer, these tubes are coated with foam coolant line insulation. This insulation can fray or deteriorate and now is a good time to make repairs. You can wrap the lines with foam insulation tape or use foam insulation sleeves. A utility knife can be used to cut insulation tape to the precise dimensions required by your unit. 6. Test the AC Unit – Once the AC unit is completely dry it’s time to test it. First, turn OFF the thermostat in your home. Next, reestablish power at the disconnect box before finally turning on the main panel. The final step is to switch your thermostat to COOL and set the desired temperature. We take no responsibility for the outcome or safety of DIY AC maintenance. But if you have a problem, please call us directly at 617.964.1600 to help solve it. Overwhelmed by the DIY process or just don’t have the time to do proper A/C maintenance yourself? Hire a maintenance professional to stay on top of the quality of your machine, further supporting your investment by adding longevity to it’s lifespan. Learn more about your AC options for home or office. With the right care and proper maintenance by a professional you can avoid common issues or machine failures that leave you without A/C in the hot summer months when it is working over time. You will save money with our total comfort plan. It is understandable if you are looking to do it yourself to save some costs, but doing your own maintenance could have negative effects over the long term efficiency / quality of the unit. Make sure you also research the finer details on the warranty of your Air Conditioning unit. Lost efficiency of the AC Unit can be recovered by proper maintenance, with regular tune-ups maintaining 95% of its original efficiency. The cost of the annual tune-up will be retrieved on savings of your monthly electric bill. Have less work to think about when you have expert technicians take care of the AC units coils, refrigerants, and tell you about the compressor not requiring as much power to pump the refrigerant, leading to a lower bill. Very useful post, I must say. Thanks dear! Just a suggestion for the readers that although these DIY’s are very easy and convenient, yet safety comes first, SO make sure you be cautious while doing the maintenance of your AC’s or call a professional AC service provider simply.